I like it. Not sure if I love it yet. I love seeing a version of Gwen Stacy shine. During this first volume, there are some split-offs. Like the Spider-verse comic happens in the middle. So I felt like a bit of development was missing I think as I haven’t seen her have to deal with that. Seeing another Peter Parker in Spider-verse does affect her visibly, though. 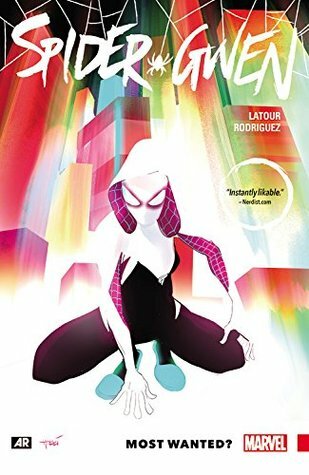 In Spider-Gwen’s universe, Peter Parker dies trying to be a hero like Gwen and it is something that you can see will affect her for a long time. Loved the conversations she has in this with May and Ben. They are really a part of her life here. This is all pre this comic starting which I appreciated. Didn’t feel like I needed a big origin story for her. She got bit by a radioactive spider. We get it. You know the story now move on. I liked that a lot. I feel like it worked for this. The Miles Morales comic I read recently was the same way. I think I’m starting to prefer things in media res for my heroes. Gwen’s dad is a cop. In this volume, she struggles with her father because she is the vigilante he is supposed to be hunting. I think this will be really interesting going forward. Spider-Pig exists and it throws me off so much. Like wow. Matt Murdock is a bad guy in this universe. Vulture is pretty hideous. Mary Jane Watson has a band called The Mary Jane’s with a song called Face it, Tiger.She also has such a mean girl attitude, to be honest. Earth 65 is so strange man. Daredevil as a bad guy is sort of the best thing ever, though, like still blind, Same abilities. Just a total bad guy and I kind of loved it. It was amazing. Like lawyer for the Kingpin. Not to be messed with. Vulture was shaking in his boots. This is not a guy you should cross. I think I love every Felicia Hardy but this one is so strange and an international star. I love it. Felicia and The Black Cats. I was rooting for her in this one. Gwen gets many likeability points. Has a cat named murder-face. Is a drummer in a girl band. Like yes. The Mary Jane’s has more drama than One Direction but still. She hallucinates other Spider people. I don’t know how I liked that part but I think I did. It’s a good start. Excited to read more. This comic starts off with a pretty awesome team up. I never saw the character Midnighter teamed up with until this but it was really great. I really like Dominic Mndawe.I always appreciate learning about diverse heroes. Dominic Mndawe is a South African man with the power to fuse two animals together, some mind control, and probably more. I need to read more comics on his character for sure. 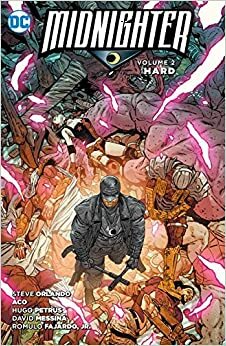 Then we get more into Midnighter dealing with the issues from the last volume. He experienced a betrayal. He’s hurting but in a Midnighter way. So he’s out beating up crime wherever he can. He’s dealing with all these emotions when we get into what we will really be facing in this volume. Henry Bendix. A man from Midnighter’s past has come around to create more soldiers with the capabilities of Midnighter. Midnighter has to fight people who can get around his ability to see several steps ahead. It’s a really good volume. I still love Marina Lucas.She shows up in this volume in a different role than before. I like that she’s someone Midnighter can rely on. He saw good in her when others would have just locked her up and thrown away the key. It’s more insight into who he is moral wise. he operates in the in-between. I need people to get some Marina Lucas images on the web. Fanart too. I know she makes appearances in the upcoming Midnighter and Apollo series and I’m looking forward to it. Helena Bertinelli in the New 52 is pretty cool from the little bit on her that I’ve seen. She’s the big shot caller at the organization Spyral. We get to see Spyral at odds with Amanda Waller and her suicide squad in this volume which I think was one of my favorite things. Midnighter going up against Harley Quinn and Deadshot was really awesome. I would not mind seeing more of Midnighter versus the suicide squad or working with them one day. They were all so good going up against each other. When things get really rough Midnighter reaches out to someone he can always count on and I won’t say who that is. Just pick this up and love it like I do. Super excited for the release of Midnighter and Apollo this year.I definitely need more Midnighter in my life. This comic is so good. I wasn’t expecting things to happen the way they did by the end. There is a beautiful collection of characters. These kids come together because they find out their parents are super villains.Plus, their parents kept some other secrets from them. Like that some of them have some super abilities they don’t even know about. 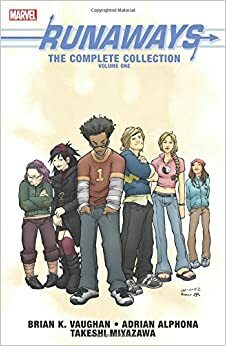 The runaways are a good team.Each member brings something great and different to the team.They are able to come together and get down to business when they need to but they are also still kids.They are young. When they first runaway they don’t really have a plan. Their parents have a much further reach than they expect so how can they face them. They are good villains. Scary villains at times with what they are able to acomplish. They were sometimes relatable too which is scary. The one big crossover in this volume is when The Runaways go up against Cloak & Dagger. I thought it was a great part of this arc.The way things ends there was kind of as I expected so early on in the volume. There are queer characters. I was all about it. I didn’t expect some of the relationships in this comic. Either of the two at the end really.I was happy about them, though. Excited to see how they are handled going forward. The big twist in the last section really threw me off. I didn’t expect it. I was trying to piece together so much and anticipate what could happen and ruled out something without even realizing I did. I was genuinely surprised by that ending. I was shook as they say. I am excited to read more of this comic in the future. This was a great arc over this volume. 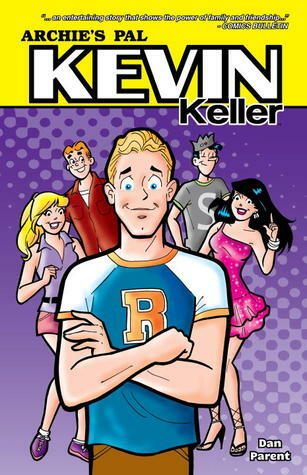 Read all about Kevin’s introduction to the world of Riverdale! Journey into the mind and heart of Riverdale’s newest resident. You’ll see how Kevin first met Archie, Jughead, Betty and Veronica; how he came to love journalism, and what drives him to want to follow in the footsteps of his father, a retired Army Colonel, and serve in the military! Experience what it was like for Kevin growing up and how he learned to deal with all kinds of issues ranging from schoolyard bullying to discovering who he is and who he wants to be. I absolutely love how these comics introduced Kevin. The first comic in this set was really funny. Poor Veronica falls for Kevin’s good looks and no one tells her that he’s gay even though they all know. Jughead and Betty have their reasons of course. Loved Kevin’s fast friendship with Jughead. He’s treated just like any other character in the comics really. He fits into Archie’s group really well. Easy conversation wit Betty and Veronica. Similar attitudes to the group. For a while, he seemed too much of a Gary Stu, though. He’s an aspiring journalist.He’s really smart. He’s an army brat that wants to join the military so he’s pretty athletic. In the later comics, you start seeing him more like a regular teen. He’s awkward. He gets stage fright. He’s a bit clumsy. He doesn’t always know what he’s doing. My favorite comics were the ones that gave us background on him. Why he started writing and why he wants to join the military. How he met his closest friends. It gave a lot of insight into the character.Also loved the running for student president arc. I liked seeing how Kevin dealt with homophobia and seeing Archie and the gang sticking up for him. Even Reggie. In the fifth comic, there is a little cliffhanger with Jerry. I need more on what’s going on with him. Someone, please tell me if that happens in later comics. Not just the small bit about him we get in the sixth comic of this book. I definitely had some other issues here and there. This is straight up cheesy most of the time but I really couldn’t stop smiling. I was definitely ready to see some kind of romance plot for him when I finished this set because I realized there really wasn’t any of that in the first six Kevin Keller comics I read. Hoping there is a little of that in the next collection.